On Dec 11, City Center turned 75, and this season is Alvin Ailey American Dance Theater’s 60th. 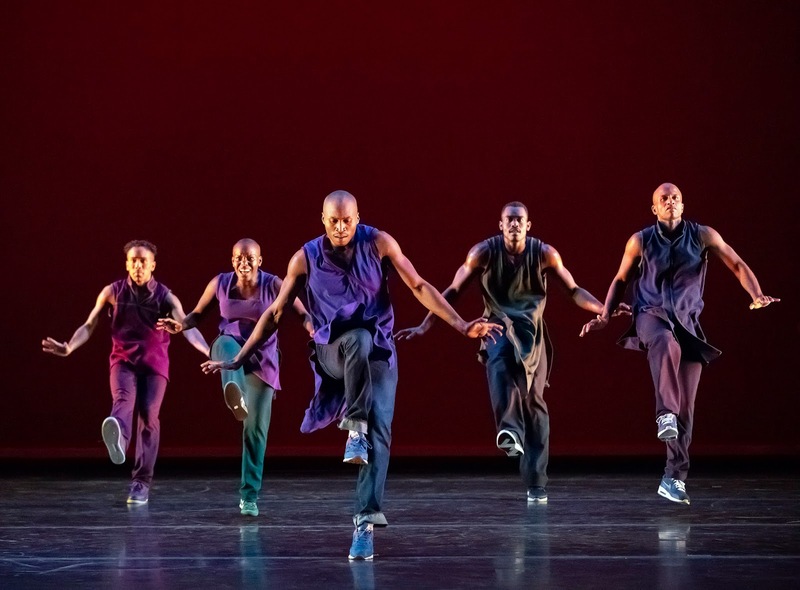 They celebrated together with a program featuring not only Ailey’s finest, Revelations, but also longtime City Center artists Paul Taylor and Twyla Tharp. 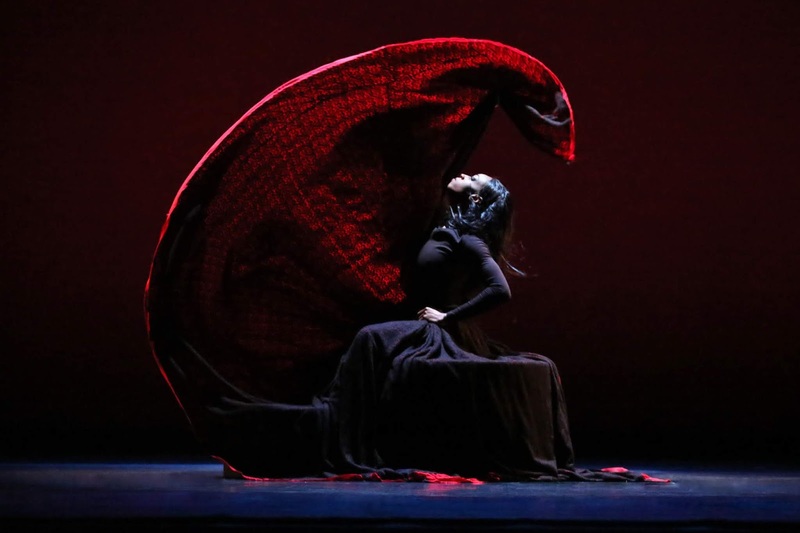 The evening showcased Ailey Company’s strengths and weaknesses underlying its artistic model. The late Paul Taylor’s work might seem a fine fit for Ailey, but its “cover” of Piazzolla Caldera merely skims the surface of this rather dark dance. Its two most important characters are the first male solo and the spurned woman (done respectively and most memorably in recent years by Taylor’s Michael Trusnovec and Annmaria Mazzini). The man leads the group of men, moving first and slicing and attacking like a toreador. Jamar Roberts performed this role for Ailey, and lacked the necessary ferocity, thereby diffusing any dramatic tension. The female part was danced by Jacqueline Green, who also presented very little of the built-up angst and desperation of the character, who is cruelly rejected by every man on stage. Both Roberts and Green are tall, lithe, elegant dancers, but in this case lack the grit and aggression that roil beneath the surface of this deceptively shadowy piece. The Taylor lexicon also might appear easy from a technical point of view. Stag leaps, low jetés, and chassées comprise its core. The Taylor company obviously renders these moves constantly in Taylor’s repertory, thus they are consistent among performers. The Ailey company doesn’t perform these daily, and each dancer does the moves slightly differently, resulting in a lack of visual cohesion. When you watch the Taylor company, there are passages when these synchronized sections whir and click like a Swiss clock’s movement, creating visual harmony. I missed this tuned, symphonic sense with Ailey’s interpretation. Twyla Tharp’s Golden Section is a signature work by this uncategorizable, prodigious choreographer, and a very challenging one to perform. It’s not easy to appear as if you’re carefree and louche while doing super hard steps that require great coordination and precise timing between dancers. That said, Ailey has been performing this on and off for many years, and it looked better synced than I remember. David Byrne's jaunty score, which hasn't aged a bit, does a lot of heavy lifting by moving the action along. The program on Dec 18 offered highly contrasting works. Wayne McGregor’s Kairos (2014), a company premiere, offers more of the British choreographer’s affinity for exaggerated positions and ballet shapes. While Ailey’s dancers are obviously accomplished in many styles, they aren’t strictly ballet dancers, and so many of the lines that might make sense on point, or on exaggeratedly balletic bodies, here feel blunted. 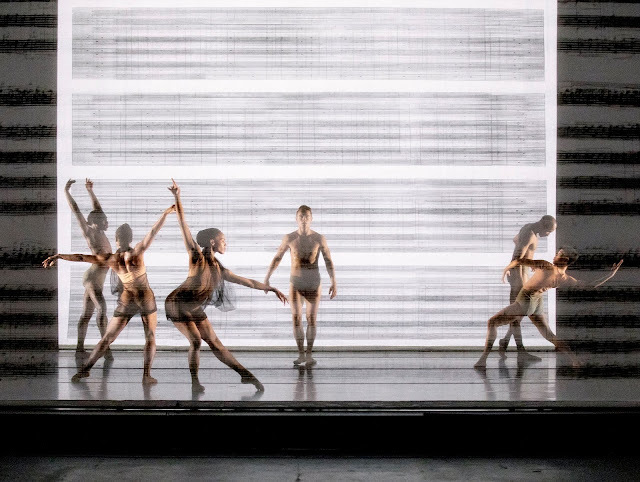 Idris Khan’s set—scrims with graphics resembling musical staff lines—make the dancers appear like musical notes. But this somewhat promising metaphor is diluted with the use of Max Richter’s version of Vivaldi’s Four Seasons, a by-now clichéd composition that elicits thoughts of background car commercials. McGregor’s athletic, balletic style may be tempting to set on Ailey for many reasons, but for me there is an emotional void at its core. How wonderful then to follow this soulless work with the world premiere of Rennie Harris’ Lazarus in two acts. 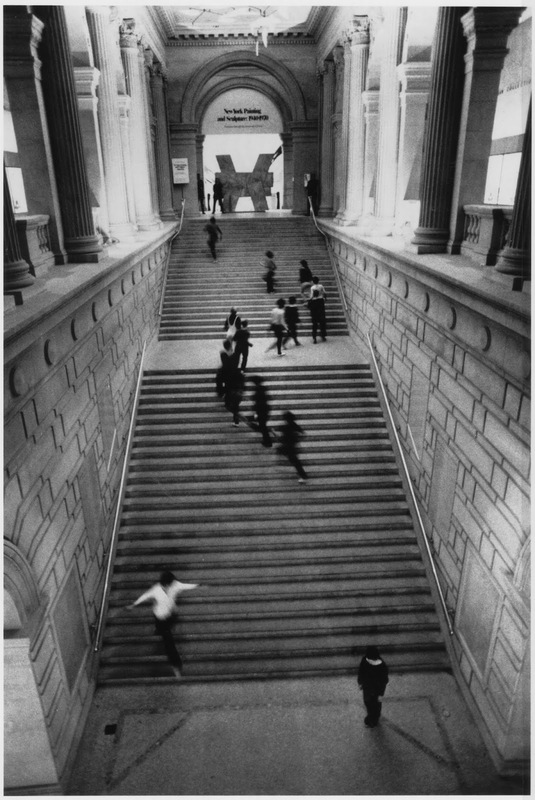 A central character (Daniel Harder) falls and rises several times in the piece, a motif that could be seen through various lenses in civil/human rights—racial, economic, despotic—or even as a metaphor for an artist and his life and work. The beginning of the piece feels like a dream (or nightmare) scape, with a soundtrack mixing words and sounds (barking dogs) accompanying seemingly discrete scenes featuring a group working or praying. They support Harder as he coughs and collapses, and in a harrowing scene that elicited gasps, lynched bodies achieved through the simplest of gestures—a listing head and small twists of the body on the balls of the feet. Jamar Roberts supports the stricken Harder, who then does an arduous phrase, falling forward with the body folded, rear leg aloft. The pace quickens to Michael Kiwanuka’s “I’m a black man in a white world,” and the costumes shift from old fashioned cotton blouses, skirts and pants to more modern garb. The group claps, skipping and crossing their feet, but then appears to be sprayed with fire hoses. Jeroboam Bozeman, wearing only jeans, symbolizes modern man acting with individual intent. The corps, lying down, transforms from a sprouting field, to waving grass that subsumes Harder’s body, to cresting waves. In the second act, the dancers sport LA Laker-inspired purple and gold tunics. The movement is less trance-like and more rhythmic, clicking and snapping crisply. Harris’ choreography is less reliant on the hip-hop in which he made his name, with more strands of upright fast footwork and joyous space-eating steps. (It feels very connected to Ron Brown’s style.) The pure joy of dancing is rapturous and contagious, and the dancers literally dust off their heels, shaking off the historical luggage and issues of mortality to simply live. Harder walks toward the light, and the audience departs on a cloud. A couple of notes on dancers: Clifton Brown looks truly joyous and inspired in Revelations, after so many years performing it on and off; his power and stasis in "I Wanna Be Ready" are particularly moving. Vernard Gilmore has been with the company for 21 years, and has gradually (for me) developed into its emotional center with his unshowy, grounded approach in a company of spectacular dancers. If Twyla Tharp had failed at choreography, which she obviously hasn’t, she could’ve become a professor. Half of Minimalism and Me, the Twyla Tharp Dance program at the Joyce Theater (Nov 14 to Dec 9), features Tharp at a downstage lectern recapping the ideas behind works between 1965 and 1971, accompanied by priceless video footage of original company members and live performance segments by current dancers. It’s an excellent primer on a less-known period in Tharp’s prodigious, multifarious career which is best known for Broadway smashes and symphonic ballets. She traced her path through minimalism, citing simple concepts: the body at a right angle, standing in releve in a star position for 2+ minutes (demonstrated by an implacable Kellie Drobnick), placing one foot in front of the other, and putting the performers behind a wall. Tharp placed an emphasis on learning, not presenting; and going for shock and not entertainment. These experiments were done mainly without a large audience, although for the purposes of the demonstration, a small group sat on folding chairs and conveyed puzzlement or comprehension. In the wake of that epiphany came The Fugue (1970), an excerpt of which Kara Chan, Drobnick, and Reed Tankersley performed. It’s full of experimentation and invention, blending numerous forms of dance genres such as tap, modern, jazz, gesture, and body percussion, and solos and intricate interplay among the trio. The second act of the evening comprised the 1971 opus Eight Jelly Rolls, in which the previous dancers were joined by Matt Dibble, Ron Todorowski, and Mary Beth Hansohn. It’s looser, more playful, and presumably takes cues from the accompanying music, by Jelly Roll Morton and Charles Luke. Tharp expands the kinetic ingredients from The Fugue to include more ballet, vaudeville, quotidian and gestural movement, giving each individual dancer sections that correlate with each one’s character and strengths, as she has always done. Chan has a standout solo done as if tipsy; Jennifer Tipton’s lighting features Chan in white hues while the upstage dancers are bathed in blue to create a background. Drobnick—lanky, fluid, and magnetic—has a quieter passage of poses, small moves, and stasis, echoed by five others. In a coda, Tharp pokes fun at her aging self, skipping and running after her young brood, and being lifted and spun rapidly, held by her heels (a repeat trick from a recent past Joyce run). While her company is technically stellar, when Tharp is onstage at the Joyce—whether teaching or moving—there’s no doubt who the star is. In a sense, it was business as usual at NYCB’s fall fashion gala, “the most important night of our year,” as Teresa Reichlen put it in pre-show remarks at the Koch Theater on Sep 26. Somehow it felt more trite than that in the wake of the departure of Peter Martins last spring, and more recently three male principals, leaving the company in limbo both leadership-wise (currently four company members share that role) and with a shortage of tall leading men. Three new dances focused around fashion designs were hardly the headline. Reichlen’s speech alluded to the departures: “We won’t allow talent to sway our moral standards.” There’s no dispute this is moral high ground, and yet who among them—us—are unimpeachable, morally? And yet in the face of powerful figures falling each day, the high ground seems to be the only safe spot. 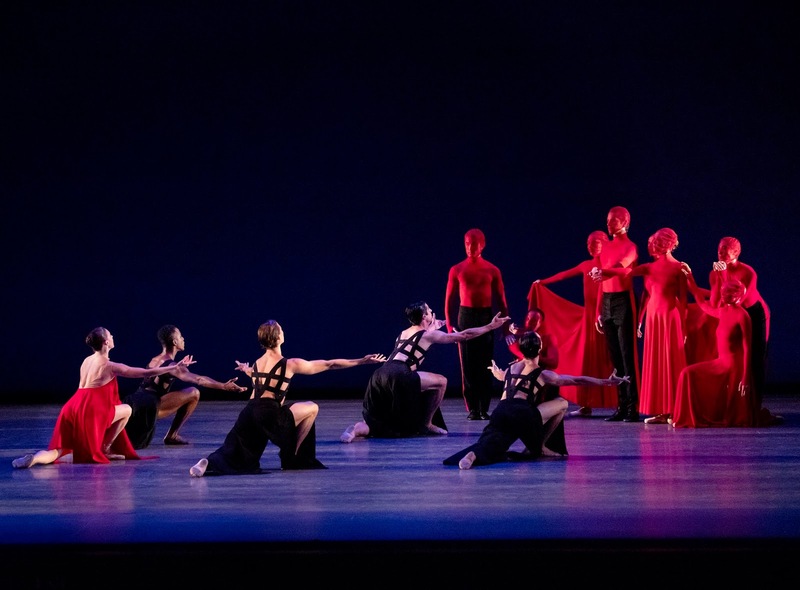 Those remarks set the tone for three premieres which felt, as the evening passed, increasingly what the future will look like for new repertory for NYCB, apart from by now stalwarts Justin Peck and Chris Wheeldon. Matthew Neenan’s The Exchange seemed to pit the old against the new, or conservative vs. liberal, religious vs. atheistic, etc. In any case, a group of rule-bound people (the women in Gareth Pugh’s Martha Graham-esque long red gowns; the men in drum major reds and blacks; all wear red chiffon head covers) move in an orderly fashion, before the rebels (in short tablecloth, diagonal-drape dresses; the men in strappy harnesses and gaucho pants) move in and shake things up. The Dvorak accompanying it set a mostly solemn tone, with hints of Slavic dash. Still just 19, Gianna Reisen’s second work for NYCB, Judah, is set to John Adams’ frenetic score. 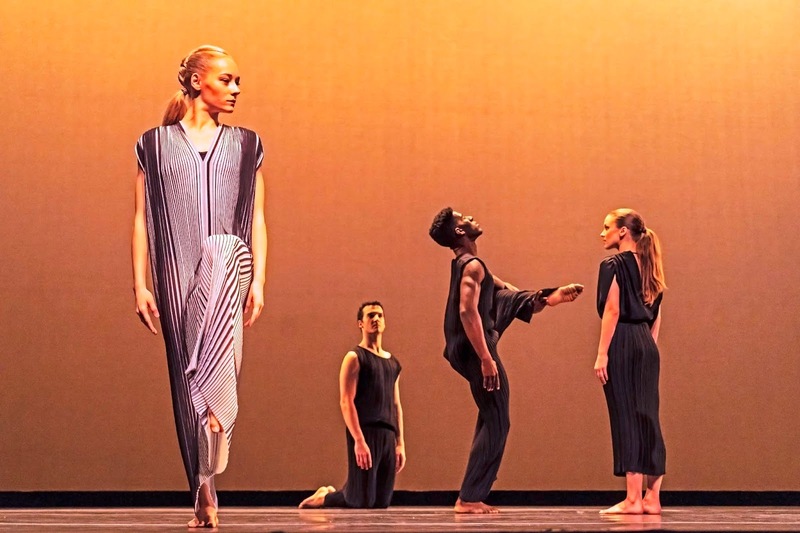 Four dancers began the piece by walking onstage in front of the curtain, which then parted to reveal staircase segments on each stage side (an allusion to Apollo, intentional or not). Perhaps because Reisen is a woman who performs, sometimes on pointe (with LA Dance Project), she pushes the capabilities of NYCB’s women, who are astounding athlete-artists. An indulgent arc of piqué turns, or an arabesque “nailed” after running to a spot, or finishing a pirouette with an extended leg rather than a planted foot are examples of such ambition, rewarded. 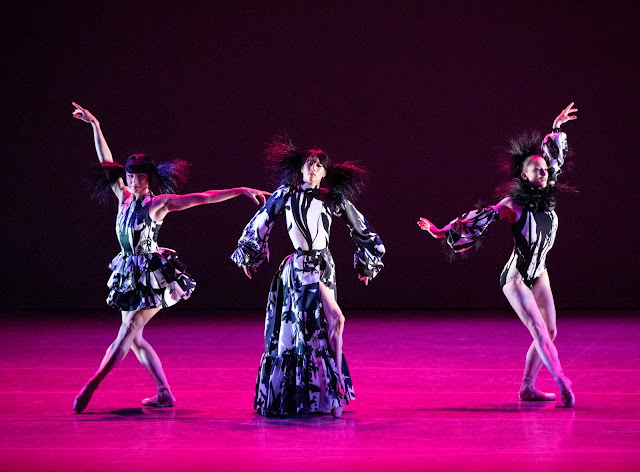 Alberta Ferretti designed the costumes—scarf-draped dresses and unitards with, oddly, silhouettes of dancers printed on them. 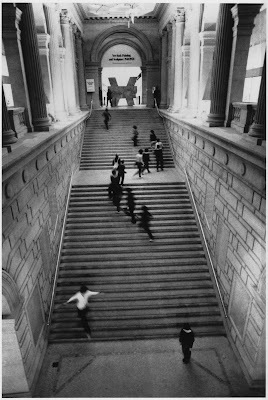 Reisen uses the stair elements as perches and launch pads; Lauren Lovette leaps off of one into Preston Chamblee’s arms. Harrison Ball showed his power and magnetism in a featured role. Reisen packs a lot into the piece, which sometimes feels frenzied, but merits another viewing. Kyle Abraham’s The Runaway promised to be the mystery of the program since he had never choreographed a ballet. The curtain rose to reveal Taylor Stanley (in a black and white romper, by Giles Deacon) in a solo that began and ended with him slumped over and blossoming like a flower. It perfectly showed his absolute precision, nuance, and impeccable line, and which blended ballet with Abraham’s richly varied lexicon, from break to club to voguing. Unfortunately, Deacon’s costumes for some of the other dancers, mainly the women, were baroque and overwrought; headpieces with big side extensions looked ridiculous and rendered the women unidentifiable. The mixed soundtrack ranged widely from Nico Muhly to Kanye to Jay-Z, and perhaps the sound of hip-hop and rap in the Koch Theater felt like the most revolutionary thing about the night. At the same time, it adrenalized the dancers and created an interesting tension with the tradition and classicism associated with the institution and theater itself. Despite the contemporary music, the ruffles, feathers, and crinolines used by Deacon created a courtly atmosphere. Punchy solos were danced by Ashley Bouder (in a flapper mini) and Georgina Pascoguin, who shed a bulky skirt with a sassy toss reminscent of Ratmansky’s fourth wall-breaking asides. 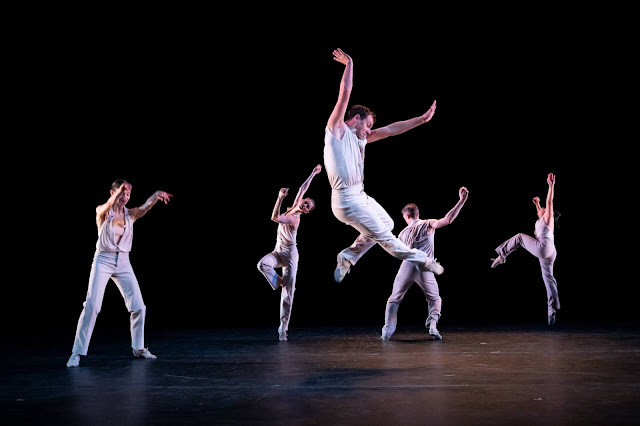 In some ways, Abraham’s fluid, heady mix of styles evoked William Forsythe, who has underscored the physical intelligence of dancers to transform them into incredible alien beings. In the end, Stanley resumed his bowed position alone. Fittingly, the work began and ended with him, currently one of the most exciting dancers in a temporarily depleted troupe that is facing revolution on several fronts.